We’d love your help. Let us know what’s wrong with this preview of What About Us by Emma Tharp. But letting go of River McEwan is the hardest thing she's ever done. Moving on is even harder--especially when River doesn't want to let her go. As the two resist their passion f Torn between her desire for the guy who has her heart and her loyalty to her best friend, Kate Bergman knows she must break her own heart to give her broken and fragile friend a shot at happiness. To ask other readers questions about What About Us, please sign up. What About Us picks up where What About Her ends. It’s book two of the Bluff Harbor Series and is the conclusion. I really recommend that you read the first book to know more about the story and all the characters. Willow’s alive! She’d been missing for nine months, and has no memory of where she’s been, or what happened to her. Her parents had a memorial service for her, so sure she was not going to be found, while her best friend Katie was certain she was still alive. She’d no proof, just a f What About Us picks up where What About Her ends. It’s book two of the Bluff Harbor Series and is the conclusion. I really recommend that you read the first book to know more about the story and all the characters. Willow’s alive! She’d been missing for nine months, and has no memory of where she’s been, or what happened to her. Her parents had a memorial service for her, so sure she was not going to be found, while her best friend Katie was certain she was still alive. She’d no proof, just a feeling. Even River, Willow’s boyfriend at the time, thought she was dead. Katie started dating River, despite the guilt she felt, having grown closer to him since her disappearance. They’d all been friends since childhood and Katie had always been attracted to him. And now she’s back and Katie feels so guilty. She tells River they need to stop seeing each other; he needs to go back to Willow. He doesn’t want to, but Katie is dead set on doing the right thing, pretending they’re just friends. Katie renews her friendship with Lane Powers and makes River think that they’re dating. That should convince River to stay with Willow. Poor, naïve Katie thinks she can just turn on and off her feelings. And, what about Willow? Where’s she been these last 9 months? Does she really not remember anything, like she claims? There are still so many strange things about her disappearance that don’t add up. Katie continues to dig into her story and it’s soon obvious that she and Willow aren’t as close as they once were. That’s why I’m so lucky. My sister has always been here for me, no matter what’s going on. I nod and start spilling. So many surprises! I kept trying to guess what had happened to Willow during those 9 months she was missing and just when I thought I knew there was a new twist! What About Us kept me in suspense. I desperately wanted to shake Katie a few times, to tell her not to be self-sacrificing, and just think about herself for a change. And poor River! In love with Katie and having to pretend that he and Willow were still involved. Can he forgive Katie? Will their friendship survive? Hmmmmm…read for yourself to find out! I enjoyed the story very much and I was right yet wrong about what I said in my review for book #1. I was right with one event but blindsided by a second. 3.5 Stars first half; 4.5 Stars second half - If you haven't read What About Her, stop now and read it. SPOILERS in regard to book 1 are below. Going into this book, I had a nervous stomach. The anticipation of what I thought was going to happen between these three friends had me fearful of finishing their story. I loved Kate and River as a couple and hated the idea of them being ripped apart by Willow's return. And while it was inevitable that there would be some tension and drama, what I didn't 3.5 Stars first half; 4.5 Stars second half - If you haven't read What About Her, stop now and read it. SPOILERS in regard to book 1 are below. Going into this book, I had a nervous stomach. The anticipation of what I thought was going to happen between these three friends had me fearful of finishing their story. I loved Kate and River as a couple and hated the idea of them being ripped apart by Willow's return. And while it was inevitable that there would be some tension and drama, what I didn't expect was the level of crazy that would ensue. I was extremely frustrated throughout the first half of the book. I felt like I was reading the inner workings of a girl in high school not a college senior about to go off to NYU for her masters degree. The back and forth of Kate wanting and then pushing River away, how she seemed to be using Lane to get over River, and the whiplash of emotions every time she was around River or Willow was exhausting. I just wanted to scream and shake her to stop the madness and torture she was putting herself and River through. It was clear that Willow really didn't care about him at all, so what was Kate's hang up? I also had issues with River pretending to still want to be with Willow and so easily giving up on Kate. If River was so in love with Kate, why would he go back to Willow? He could have been there for her as a friend no matter what Kate wanted him to do. There was no need to destroy what he and Kate had and resolve himself to be with someone he no longer wanted. In regard to the direction the story took, I had hoped that there would be less of the relationship stuff in the beginning. Going into it, I thought maybe the focus would be more on Kate and Willow's friendship and Willow's disappearance. However, there was minimal interaction between the friends, which is why it took weeks for Kate to even attempt to talk to Willow about what had been going on before she disappeared. Once the story moved into the second half of the book, I felt like I was finally getting the story I had been waiting for. We got the good kind of drama with Kate confronting Willow, the big reveal as to what happened to Willow, and the admission of feelings. I loved how the story played out and the ending. I can honestly say that the circumstances surrounding Willow's disappearance were unexpected, but what happened to her was not. Anything suspenseful and captivating is totally a must read! My heart was aching for these two individuals because even though they loved Holy cow, the suspense in this book really had me glued to my device. This is the continuation of Kate and River's story. We find out at the end of book 1 that River's "dead" girlfriend, as well as Kate's bff, had come back and she was alive and well. There is so much mystery surrounding her return. She has a bit of an amnesia, but does know Kate and that they're best friends. Her memories of River are a little fuzzy though. Throughout the entire book you can just tell they're something fishy going on there, until everything finally blows up and we find out what had actually happened to Willow and where she had been for all those months she had been missing. Kate breaks things off with River and sends him back to Willow even though he really tries hard to fight for them. Kate's poor choices leads them on a path to disaster and you can't help but feel bad for River and wanting him to find happiness. It also makes you want to slap Kate and tell her to get her sh*t together already. I am reviewing these books together because I read them together and because this is a duet. The story is about Kate, her missing friend, Willow and River. Willow is dating River when she disappears without a trace. The first book starts six months after Willow's disappearance, when all of her friends and family, except Kate have decided to move on. Kate is sure in her heart that Willow is alive and will return. All the components for a great mystery and romance story is there. A missing girl, a friend holding on, two friends coming together in their grief and finding love. The problem for me is that the components just never came together. Kate, who is in her last year of college and preparing for grad school, comes across like a high school kid versus a young adult. She is so unsure of herself and her decisions. A good example is when she finds evidence in Willow's room , she has to ask if she should bring it to the police and then when told yes, she forgets all about it. Everyone in town is determined to "move on" and assume Willow is dead but, even so, Kate refuses to publicly acknowledge that she and River as together because of what everyone will think. In book two, she makes decisions that make absolutely no sense based on what she knows of the situation before Willow went missing and is constantly second guessing herself and leaving River confused. The pacing is very slow, especially in book two (Poor Lane, Kate was always so exhausted.). Evidence and revealed truths are few and far in between with the majority of the pages spent on Kate's inner monologues and her leading Lane on. The ultimate "truth" of what happened to Willow was both anti-climactic and overdone. Unfortunately, I just found this overtly angst ridden and repetitious. I'm not sure why a duet was needed and feel had the author pulled back some of the repeated scenes that this would have worked as a single romance/mystery book. This was a combined love and mystery story full of drama. When Willow comes back from the dead, Kate breaks it off with River, knowing how wrong it was to date one's dead best friend's boyfriend. But River can't turn off his feelings as well as Kate seems to portray, and with Willow recovering from amnesia, it's hard for Kate to even think about hurting her dear friend. So she hurts herself... and River. What About Us is the second book in the Bluff Harbor series and the story picks up after the cliff-hanger of book one! I would definitely recommend that these books are read in order especially as book two contains spoilers form book one. Poor Kate, I really feel for her in this book! She is totally torn between River and her guilt over Willow. She and River make such a lovely couple and I was really rooting for them but as with the first book I can understand her feelings and how confused she is about them. She is a very loyal person and her loyalty lies with Willow. She gave up her relationship with River because she thought it was the best thing to do. I also really felt for River in this book too because it is pretty obvious Kate has always been the one for him and as much as he cared for Willow she was never it for him. The passion and chemistry between Kate and River is undeniable. This book definitely threw up a few twists and turns in the storyline and again I thought that the authors’ writing was really good. The story had a nice flow and pace to it – the plot twists were believable and in my eyes the ending was perfect! What About Us was a great conclusion to Kate and River’s story and I thoroughly enjoyed it. I hope we get to see more form the secondary characters, especially Willow! Another solid 4 star read from this author! I have been waiting for this book since I finished with the first one What About Her in March. I don't do well with cliffhangers and the first one definitely ended on one. The author left us wanting and waiting for the conclusion to come out - and now that it is? It was well worth the wait. This book picks up right where the last one left off; so I do not think you could read it as a standalone & follow the story. The author wraps up the story of River, Willow & Kate perfectly - sh I have been waiting for this book since I finished with the first one What About Her in March. I don't do well with cliffhangers and the first one definitely ended on one. The author left us wanting and waiting for the conclusion to come out - and now that it is? It was well worth the wait. What About Us is the second book in the Bluff Harbor series. This is not a standalone. It's the conclusion to River and Kate's story and must be read after What About Her. It begins exactly where it left off. With Kate being conflicted. She is happy but she knows it won't last long. River and Kate's relationship was headed for a forever future. That was until Kate got the call that changed everything. Now she has to let River go. She doesn't want to. She loves him but she knows the guilt will ea What About Us is the second book in the Bluff Harbor series. This is not a standalone. It's the conclusion to River and Kate's story and must be read after What About Her. It begins exactly where it left off. With Kate being conflicted. She is happy but she knows it won't last long. River and Kate's relationship was headed for a forever future. That was until Kate got the call that changed everything. Now she has to let River go. She doesn't want to. She loves him but she knows the guilt will eat her alive. So, she breaks his heart. She tells him to let her go. To move on. She feels it's the only way to keep the peace but at what expense? I can't really get into much of the story. I don't want to spoil anything. I will say that questions will be answers. Lies will come to the surface. Twists will be had. Lives will be altered. Friendships will be tested. Ok. So, I just have to say it...I was not a fan of Kate in this book. Nope. I wanted to shake sense into her. Slap her more than once and just ugh. But I get it. She was stuck between a rock and a hard place. As for River, I felt for the guy. Overall...it was a rollercoaster ride. I finished it in a day so I was invested in the story, I had to know the secrets. And watch Kate dig her hole a little deeper and hope that she could fill it back up eventually. It's a great conclusion to their story. “Why do I have to love you so damn much?” He turns the knob to the door and is gone. The wall he’s built around his heart is too high. I have no idea how to scale it. What About Her had me SCREAMING at the end. I was so frustrated I wanted to know what happens RIGHT NOW! So when the opportunity came about to read What About Us, I may have screamed a little more because I NEED ANSWERS! There's so much going on here. I hate Kate and just wish she'd go away. Poor River! Her friend has been missing for 9 months and she moved in on her boyfriend. I get the girl code but it's been 9 months, don't string him a long. Either ya know, do your business or get off the po What About Her had me SCREAMING at the end. I was so frustrated I wanted to know what happens RIGHT NOW! So when the opportunity came about to read What About Us, I may have screamed a little more because I NEED ANSWERS! There's so much going on here. I hate Kate and just wish she'd go away. Poor River! Her friend has been missing for 9 months and she moved in on her boyfriend. I get the girl code but it's been 9 months, don't string him a long. Either ya know, do your business or get off the pot! She wasn't good to River and this made me dislike her. I get what she was trying to do for Kate, I guess, but all the games she played just wasn't my fav. So, Willow, the missing friend. Where has she been all this time? THIS is what I really needed to know. Where has she been and why is she back now? I kept trying to figure it out but the author is good at keeping you on your toes with unexpected twists. OMG what would you do for a friend? I asked myself this question through this entire book. this is the second book in the series and is not a standalone you must read the first one What About Her as this is the conclusion to River and Kate's story along with Willow's disappearance. The author tells a wonderful story full of twists and surprises that keep you turning page after page to the very end. Like I said earlier what would you do for a friend when you have to give up the person you love so your friend will be happy!!! Tough thing to do tough thing to read but this author is fabulous and tells this story so well. If you have not read the first one grab it while you one-click this one you will not be disappointed in this series and this author!! What About Us picks up where What About Her leaves off. You must read What About Her in order to follow the story in What About Us. To try to give a breakdown of the story would give so many spoilers, and I don't want to be that person. So, I'm just going to give my review based on my opinion of the story with out the additional storyline infomation. 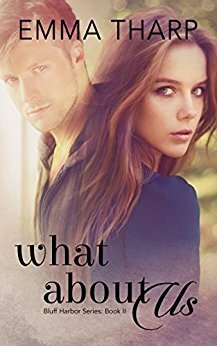 In my review of What About Her, I mentioned I was hoping for answers in What About Us. Emma Tharp didn't disappoint. We find out a lot more of the d What About Us picks up where What About Her leaves off. You must read What About Her in order to follow the story in What About Us. In my review of What About Her, I mentioned I was hoping for answers in What About Us. Emma Tharp didn't disappoint. We find out a lot more of the details surrounding Willow's disappearance in What About Us. The story twists in a completely different way about three quarters through. I am giving What About Us 4.5 stars. I really liked it and the characters. There were a lot more story lines to keep track of, but I enjoy that in my reading. After reading the first book in this series and having mixed feelings about it I wasn't sure what I was going to think of What About Us. Willow has been found and returned home so her best friend Kate has given up her happiness in order to help Willow recover, including ending things with River, who had been dating Willow before she disappeared. For me the first half of the story had too much going on too quickly. Kate was doing everything to push River away but also wasn't spending time with Willow or asking Willow what she actually wanted. Kate's character just seemed too all over the place for me. This is the second book in the Bluff Harbor series and it's absolutely necessary to read the first book before this one in order to be able to understand what's going on here since this is a continuation of the story that's already been introduced. Kate's been through some pretty difficult situations recently and it seems as if the hits just keep on coming for her. The poor girl can't seem to get a break! In putting everyone else's needs and wants above her own all of the time, she's brought her This is the second book in the Bluff Harbor series and it's absolutely necessary to read the first book before this one in order to be able to understand what's going on here since this is a continuation of the story that's already been introduced. Kate's been through some pretty difficult situations recently and it seems as if the hits just keep on coming for her. The poor girl can't seem to get a break! In putting everyone else's needs and wants above her own all of the time, she's brought herself to a point where she may end up with nothing at all in the end. This is a story that frustrated me at many points, warmed my heart at others and left me with a smile on my face when I was finished. I highly recommend reading this to anyone. This is a wonderful conclusion to What About Her. I was a bit frustrated in the beginning because we were going in circles and not getting any answers. There are quite a few surprises. I figured out some of them but was overall surprised. This duet is certainly angst filled and keeps you on the edge of you seat. Tension so palpable, at some point my eyes started leaking because I couldn't take it without some relief. By the end of the book, I couldn't help but to have a smile plastered on my fac This is a wonderful conclusion to What About Her. I was a bit frustrated in the beginning because we were going in circles and not getting any answers. This is the second book in this series by this author. This book picks up from where book one finished. Same well written characters, you will fall more in love with as you read. This is the concluding part to this story. This book will keep you guessing right to the last page. I can't wait to read more from this author in the future. This is the second and final book in this series and follows where Forget About Her ended. River and Kate have now gooten Willow back and Kate has decisions to make What will you do for a friend? This is a well written story that ties up all the loose ends from the first book and gives a satisfying conclusion to the whole saga. I don't know why it took me so long to read this book. I found it last year and put it on my kindle as I already had the first book, but got distracted by a multitude of other books and then found it again during a rainy day. I was blown away by the emotional ride that this book takes the reader. I loved this book so much. I have found a new author who I will follow so I will not miss another book. I love this series!! When I was offered an arc for this one I jumped at the chance because I couldn't wait to see what happened. This book was a book about testing friendships and trust. I loved seeing the development of the characters and how the story unfolded. Yes, I'm being vague on purpose and that's because I don't want to give too much away. If you're looking for a read with some twists and a bit of angst, I would recommend this series! Emma Tharp has taken this storyline and her characters through so many changes and brought us along on this rollercoaster ride. Showing us friendship, loyalty, fear, loss, anger, forgiveness and above all, love. This one brought all the questions from book one over, added a few more and then tied them together with a heartfelt story that will bring you to your knees. What would your reaction be? A truly unforgettable story. Yay! I finally got the ending to What about Her! What About Us picks up where What About Her ended and I'm happy I got my answers! I really enjoyed this story about Katie and River and Willow! This story is about love and friendship and has twists and turns! I won't say too much because I don't want to give spoilers! You just need to pick this up! Emma Tharp is the USA Today Bestselling Author of The Bluff Harbor Series, Keeping It Casual, Drawn to Dark, and the McLoughlin Brother Series. She was raised in upstate New York. Being an only child, she spent a great deal of time alone, dreaming up characters who would keep her company on long family road trips. Putting her writing on the back burner, she went to college and became a chiropracto Emma Tharp is the USA Today Bestselling Author of The Bluff Harbor Series, Keeping It Casual, Drawn to Dark, and the McLoughlin Brother Series. She was raised in upstate New York. Being an only child, she spent a great deal of time alone, dreaming up characters who would keep her company on long family road trips. Putting her writing on the back burner, she went to college and became a chiropractor. After spending twelve years healing patients, Emma decided—with the help of her amazingly supportive husband—to use the creative side of her brain and let her characters come to the page. If she’s not writing, Emma can be found at the gym, one of her kids sporting events, Starbucks, or a live music event.